A unique F2P title is coming at us this year, and it’s being brought by some long running pros in the industry. 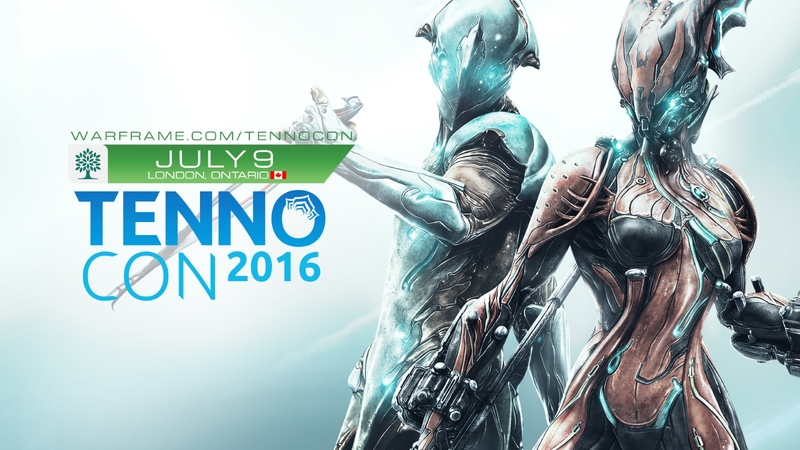 Digital Extremes, developers behind the original “Unreal” series is now working on a new third person shooter called ‘Warframe’. 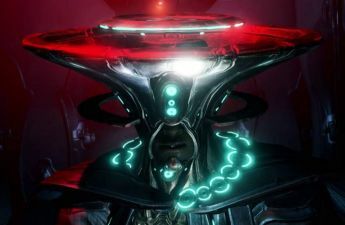 In this game, you play as ancient galaxy warriors called Tenno, which have been re-awaked to take down several different factions that have been wreaking havoc all over our solar system. With katanas and alien firearms, you’ll invade several enemy ships and complete several different objectives as quickly and/or as silently as possible. In simpler terms: You’re a freaking space ninja and will do whatever a space ninja can to save the day. While pondering these questions and loading the client up for the first time, the intro screen instantly grabbed my attention by showing off a warframe just sitting behind the log-in window. The log-in screen will always show off the previous warframe that each player used, giving everyone’s login-screen some personalization. Once logged in for the first time, the tutorial starts up in a bright and white room, and with an Excalibur warframe at the ready. The Excalibur warframe is perfect for beginners thanks to its active skills including slash dashes and super jumps as well as its stats offering balanced levels of speed and armor. As the training begins, a mysterious lady named Lotus chimes in, explaining your purpose as a Tenno and how to use your warframe properly. Learning the controls was fairly standard: WASD for movement, Spacebar to jump/climb, left mouse button to shoot, right mouse button for accurate aiming, etc. Two things that took me a bit of getting used to, however: how melee combat and active skills worked. Your melee weapon is fixed to the E key by default, and can be used at any given time. You can perform various attacks like basic standing slashes, charge attacks and more. There seemed to be a delay when performing slashes, as well as a strange hit detection when attacking enemies, so I had to take a few minutes to adjust. I also had to adjust to how active skills worked in battle, which is all set on keys 1 through 4. It wasn’t a huge issue for the easy to land skills like Excalibur’s slash dashes. But skills requiring aiming like Loki’s decoy are quite a challenge to pull off in the middle of a heated firefight, at least with the default control scheme offered. After completing the tutorial, I was given the choice to continue on using Excalibur or select one of two additional Warframes: Loki and Rhino. I decided to go with Loki as my first warframe, since I felt its array of skills for deception and distraction could prove useful in chaotic situations. I jumped into my first mission solo. The objective: Destroy a ship’s reactor core. When moving throughout the ship, Lotus chimes in saying that none of the ship’s scanners have spotted me, which seemed to imply that players can get through the mission without being seen or without tripping off an alarm to alert more enemies. I tried doing this during the first couple of solo missions, but there was always one foot solider that gets away, triggering the alarm with a nearby control panel. I suppose it is possible to get through an entire mission without the alarms being tripped, but it sure seems hard to pull off. As I expected: Loki’s skills were really handy in tight situations, even with its earlier skills such as a decoy that places a hologram wherever the mouse cursor is pointed. It lasts for well around six seconds and draws fire from all nearby enemies, allowing me to re-position myself to get the drop on enemies a lot easier. 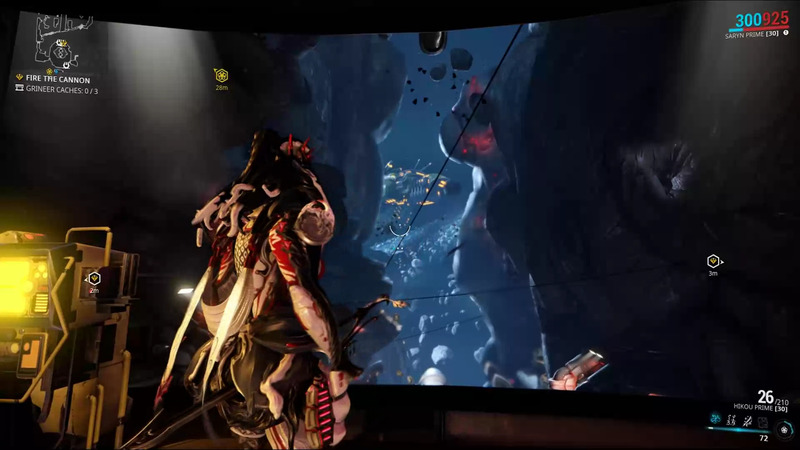 I continued on using my Loki warframe for the first couple of stages on solo mode, engaging in several different missions including collecting data nodes spread around a ship, defeating waves of enemies and rescuing VIPs. Afterwards, I decided to check out the Arsenal and Marketplace for goodies. In the Arsenal, you can customize your Warframe and weapons with different active and passive abilities, along with unlocking mod slots for upgrades. The system uses a skill tree with different paths of upgrades to choose from, such as increased firing rate, faster reload time, critical damage and more. While initial skill trees are fairly small and straight forward, players can chose to unlock a ‘pro’ version of their Warframes and weaponry to unlock more paths. However, unlocking pro versions of equipment required platinum currency, which can only be obtained with real money. It irks me a lot to see customization options and items in the Marketplace being locked behind a pay wall. Although not necessary to enjoy the game, the pricing seems a bit much for (mostly) superfluous extras. After getting re-configured, I decided to try out the Ash warframe, which had several true ninja-like qualities to it, including shurikens and smoke screens to stun enemies. When I jumped back into the first missions in co-op mode to give my new warframe a try, I was surprised to find myself starting in a brand new location. I was a bit puzzled at first, but then quickly realized that maps for each mission were all randomly generated to keep things from feeling stale with repeated play throughs; it’s a nice touch to be sure. However, this nice touch starts to get dirty as I continued to play in the later missions, as the randomization of each map doesn’t do much to mix up the tile-sets or even the design of each room. After ten missions or so, I was pretty much able to recognize almost every single room, despite starting in new locations. The game starts to mix different missions together up to this point, such as having to retrieve data nodes while protecting a VIP at the same time, but it all starts feeling repetitive. Playing with a group in co-op mode helped to keep things lively, but it also made most of the missions feel rather easy to complete. It’s all very intriguing to see a F2P shooter title that’s completely focused on PvE content, but also very risky. Every mission that can be tackled with good twitch skills and a good team, so it really makes me wonder whether a F2P business model will truly work out for this title in the long run. The game has an amazing amount of potential and could easily be one of the best F2P titles of 2013. It still has a ways to go, but I have a lot of hope that things will get better with time.